A Unique Do-It-Yourself Nativity Play! 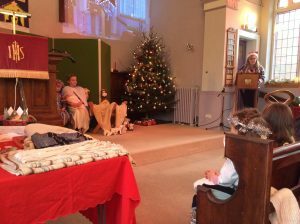 The DIY Nativity Play is purpose written for a small cast of reading age and needs….. The nativity script lasts around 15 to 20 minutes and is written entirely in rhyme, including all the instructions to and the mockery of the volunteer cast! It avoids ‘performing’ of songs by being blended with congregational carol singing, making for a lovely, Christmas family atmosphere. “Everyone said they enjoyed the service and that it had a lovely feel to it. The script is narrated all in rhyme, with participation from adults from the congregation and lasts between 15 and 20 minutes dependant upon how smoothly it is acted. No songs are provided, but hymns/carols etc can be included. The script is narrated with sarcasm, mockery and attitude as adults from the congregation join in for a fun, family service. 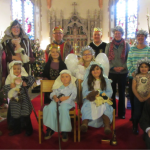 is a great way to bring young and old together in a nativity service with a difference. If you are ready to buy the DO IT YOURSELF NATIVITY PLAY click on the BUY IT NOW button below, or continue reading if you need more details. ‌‌‌Click here to see a script preview to show how simple this script is to do with minimal rehearsal and cast. When we used this script at our church our cast was too small to perform songs, so we used carols/ hymns for the congregation to sing at the appropriate places. This script therefore makes suggestions of popular carols to use, rather than providing music, which adds to the feeling of this being a nativity service rather than a play, but there are many possibilities so just choose your favourites. The narrators need to ‘act’ rather than read, as there is a good deal of sarcasm, attitude and mockery written into the narration so it is important that the narrators are familiar with their parts and read it confidently and with expression. The narrators need to interact with the congregation and the few actors of the play, so they need to rehearse the necessary pauses and expected reactions of the audience. The actors simply respond to the narration, so minimal rehearsal is required just to be familiar with what happens and when. nb. It might be worth preparing some of the congregation to make sure that some-one is prepared to join in: there’s no harm in giving some of them a little bit of notice and they can still join in unrehearsed. Just £9.95 for an instantly downloadable, customizable word document of the script, with an additional pdf copy. The wonderful good news in Jesus’s name. The free poem “The Message of God’s Grace” highlights this further if you choose to include it. 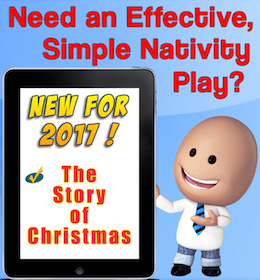 If you are ready to buy the Do It Yourself Nativity Play, click on the BUY IT NOW button below, or continue reading if you need more details. I pride myself in making my scripts the best value for money around, so The D-I-Y Nativity Play can be downloaded instantly to your computer for the special low price of just £9.95. The “D-I-Y Nativity Roll Call” performance poem, which has a powerful message for the congregation, and makes a fabulous and unique finale for your nativity service. Done in the style of a rhyming ‘register’, this gives everyone involved the opportunity to be acknowledged (and to respond with “here”). This idea has been so well received that it has become my trademark and I now write a ‘Roll Call’ for every script. The “The Message of God’s Grace” : A purpose written Christmas rhyming poem which can, if you choose, be read out to round up the message at the end of your nativity play. Grab your LICENCE FREE COPY of the Do-It-Yourself Nativity Play script at the ……. The customizable word document is provided as standard without the need to upgrade. but these can be omitted and replaced with congregational carols if preferred. Still prefer the Do-It-Yourself Nativity Play? You have a very special outreach ministry, and this is my way of supporting it. Don’t ever underestimate the difference that you are making in sharing this powerful story in such a simple and beautiful way. Have great fun with your nativity play/ service and have a fabulous Christmas.